TSPSC Telangana Dairy Recruitment 2017. Telangana State Dairy Development Corporation Federation Limited (TSDDCF) Various Posts Recruitment 2017. 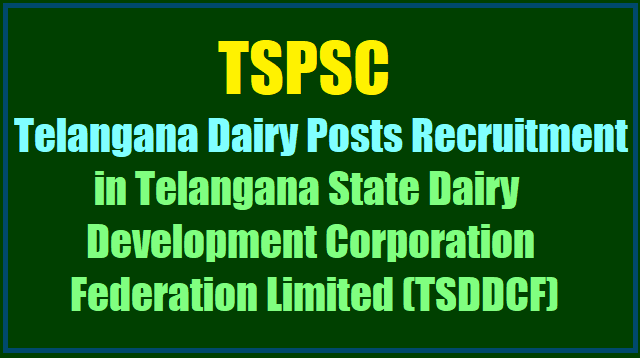 TSPSC Assistant Dairy Manager /Manager Gr.II, Assistant Quality Control Officer, Junior Engineer(Mech), Junior Engineer(Civil), Processing Supervisor, Field Supervisor, Supervisor (Mktg), Plant Mechanic, Electrician Gr.II, Boiler Operator Gr.II, Plant Operator, Marketing Assistant, Field Assistant, Lab Assistant Posts recruitment in Telangana Dairy. TSPSC Eligibility Criteria, Scheme of Exam/Exam pattern, Selection Procedure, Recruitment Guidlines, Online application form, Hall tickets, Selection List Results and Telangana Dairy Recruitment details would be issued soon. Telangana State Government has accorded permission to fill (110) one hundred and ten vacant posts in Telangana State Dairy Development Corporation Federation Limited (TSDDCF) through Telangana State Public Service Commission. G.O.Ms.No. 143 Dated: 09-10-2017:: GOVERNMENT OF TELANGANA, FINANCE (HRM-II) DEPARTMENT :; Public Services - AHDD&F Department - Recruitment – Filling up of (110) one hundred and ten vacant posts in Telangana State Dairy Development Corporation Federation Limited (TSDDCF) through Telangana State Public Service Commission, Hyderabad - Orders – Issued. AHDD&F (Dy-II) Department, U.O.No.3566/Dy-II/2016, dt.27.09.2017. ORDER: Government have reviewed the Direct Recruitment vacancy position in Telangana State Dairy Development Corporation Federation Limited (TSDDCF). After careful examination of the proposal furnished by the Department and keeping in view the actual requirement of manpower with reference to the nature of work and activities of the department and also the overall financial implications, Government hereby accord permission to fill (110) one hundred and ten vacant posts in Telangana State Dairy Development Corporation Federation Limited (TSDDCF) through Telangana State Public Service Commission, as shown below. 3. The AHDD&F Department and the Managing Director, Telangana State Dairy Development Corporation Federation Limited (TSDDCF) shall furnish details of all vacant posts authorized in this order, including the local cadre wise vacancy position, roster points and qualifications, etc., to the recruiting agency immediately under intimation to Finance Department. The Department shall issue necessary amendments to their service rules / Bye-laws /Government Orders changing the existing recruitment procedure / recruiting agency, wherever necessary.